Destiny 2 might be the top looter shooter on the market today, but The Division 2 has exposed some of its weaknesses. 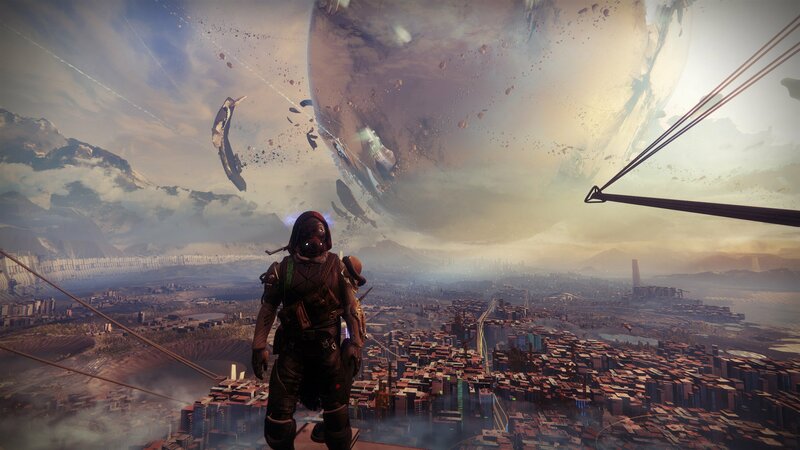 One could argue that Destiny 2 is the current top dog when it comes to looter shooters, but the folks at Bungie could stand to press pause and look closely at The Division 2, a game which handles loot and their character customization options in a much deeper manner. Coming off about 650 hours of Destiny 2 since its launch, playing The Division 2 has been a breath of fresh air, and it's not hard to see why. 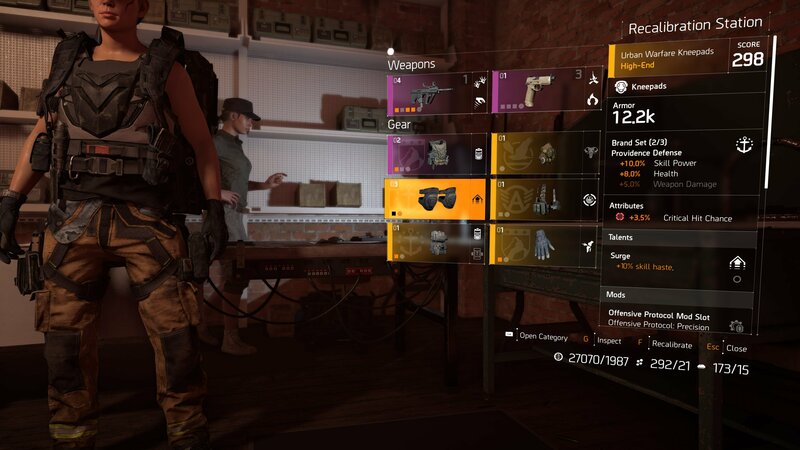 About every half hour or so my team and I hit up a safe zone in The Division 2 so we can rummage through the mountain of gear we’ve just received. Every piece must be inspected, not just for how much damage or armor it boasts, but to compare it with currently equipped items and find out if it can push my build forward. Perhaps it will bump my skill power to a spot where I can equip a certain mod, or maybe it lacks a bit of protection but elevates my gear score slightly. 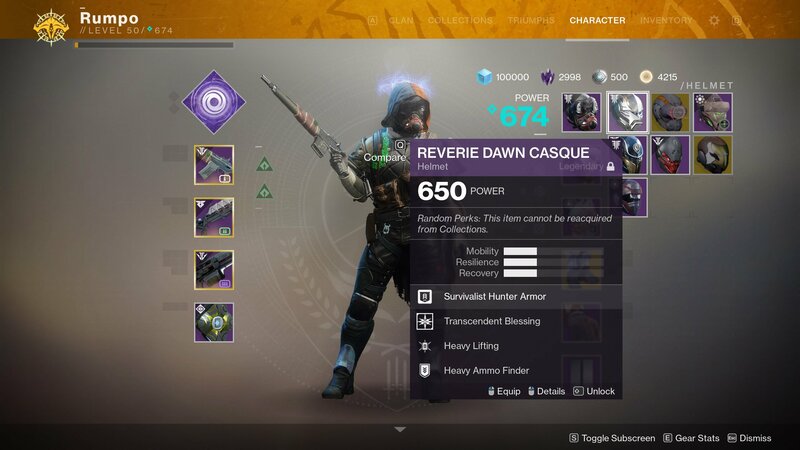 Each piece of loot is part of a network comprised of damage, armor, health, perks, mods, talents, skills, and gear score. No attribute rules alone, and the complexity of this network allows players to fine tune builds to create a character tightly suited for their style of play. In Destiny 2, power is the only must-have in the game. With enough power, any activity can be completed. With each increase of the power cap Guardians begin looking like they dressed in the dark. Fashion and aesthetics are no longer priorities until max power has been reached. Along this path there is little care or concern for what perks and rolls are on each piece of equipped armor, and there is little chance one would bother to mod it. Whatever dropped from that public-event chest will be turned into weapon parts in 20 minutes when the next item drops with a single point of extra power. Any veteran player can give you a list of must-have gear in Destiny 2. There are weapon and armor options which are objectively better than the rest. As a Hunter in PvE, I’m almost certainly running Shadow Shot and Orpheus Rig, and I’d expect rude messages and funny looks if I chose something else. There is a meta and it’s almost considered negligent if you’re not running it. It gets worse, though. It’s not just that there are only a few viable options when it comes to weapons and armor, it’s that the perk and mod system in Destiny 2 is utterly boring. Almost every worthwhile perk on a piece of armor is tied to ammunition acquisition in some way. The default check for me is to see if heavy ammo will drop more frequently, or if I’ll get more heavy for a specific weapon if I do find some. It is a perk system centered almost entirely around fixing something that has been a problem for Bungie and the Destiny franchise off and on for nearly five years; an awful ammo economy. 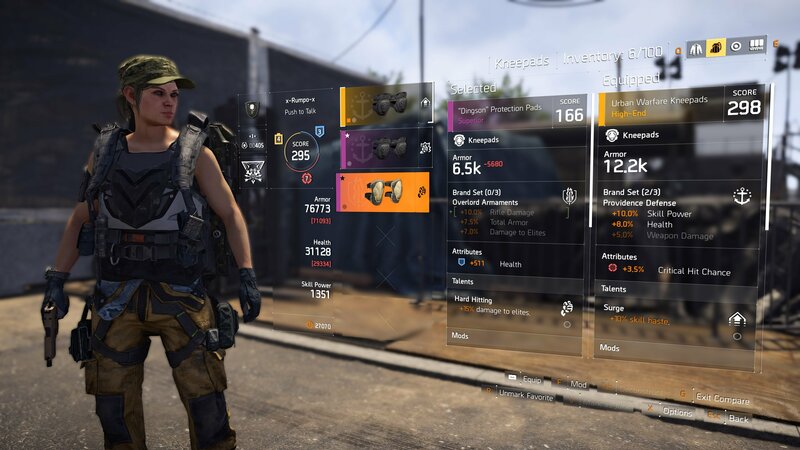 I don’t believe I’ve ever run out of ammunition in The Division 2, and the perks and mods are infinitely more interesting and important than in Destiny 2. I’m more concerned about upping my damage to elites or increasing the damage of headshots to complement my sniper rifle. I might get a new set of kneepads that give me a bump in armor but equipping them could negate the bonus I’ve got because I’m wearing three pieces of gear from the same set. Every decision about gear must be weighed from several angles, and there is rarely a right or wrong way to do things. The Division 2 also features a recalibration station. This allows me to take a piece of gear that I don’t need or want and rip it up to extract one of its perks. I can then apply that perk to another piece of gear, essentially creating my own god roll. Destiny used to allow players to roll gear through the Gunsmith, which gave a feeling that I had some measure of control over my build. That system was abandoned with the launch of Destiny 2 when Bungie opted to demolish and rebuild instead of evaluate and renovate. As of right now, almost all drops in Destiny 2 are random, which wouldn’t be so bad if there was an equivalent to the recalibration station in The Division 2, or if pulling randomized drops from your collection rolled the gear. For now, Guardians have but one option when trying to steer their character’s build; grind more random drops. Fortunately, Destiny 2 is only a few small features and an infusion of new and interesting loot away from getting back on track. The thing that concerns me the most, and maybe I’m missing something, is that there has been no sign that they’ve even recognized there’s a problem. Updates through the annual pass have come often enough, but there’s lacking in the primary point behind a looter shooter; ample and cool loot that players want to chase. This problem is made worse by Bungie’s refusal to bring Year 1 loot forward and keep it relevant, or to enhance weak gear rather than nerfing strong gear. Pure speculation on my part, but it feels an awful lot like there’s a fear to go crazy and experiment with how weapons, armor, and abilities work. Almost as if Bungie is afraid that they will break PvP, which is probably why players have been suggesting for years that PvP and PvE weapon and armor stats should be separated. Only Bungie knows what’s in store for Destiny 2, but The Division 2 should have the folks at Bungie shaking in their St0mp-EE5 exotic boots. Being the champ might mean you’re the best, but the moment you stop evolving and get complacent, a hungry contender punches a hole in your player base. Blizzard should make a Diablo-loot FPS and show them how it's done. Played competitive crucible the other night and one of my clanmates was running triple nade launchers. He was the top scorer every game we played. The meta doesn't matter at all.